Marawi is the capital city of the province of Lanao del Sur in the island of Mindanao in the southern Philippines. It is considered the center of commerce in the region, being the gateway to the Autonomous Region of Muslim Mindanao. 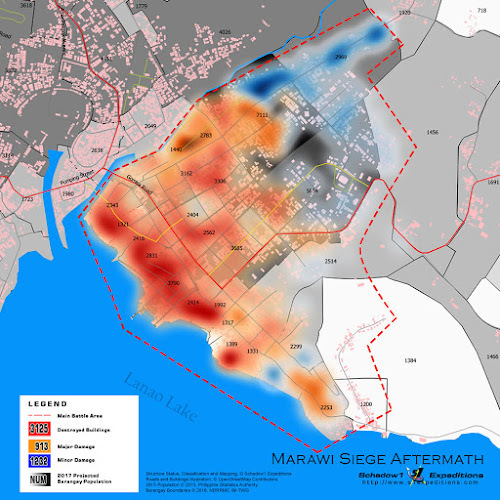 On May 23, 2017, the Abu Sayyaf and Maute Group, both ISIL-inspired extremists factions in the Philippines, has held the city hostage which resulted to a 5-month long battle with the Armed Forces of the Philippines. 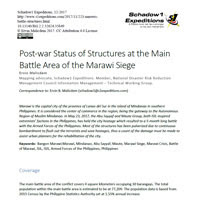 The conflict has tested the capability of the government forces who are primarily trained through jungle-warfare as the battle ground, from the usual thick foliage, now has taken place in a highly-populated, concrete jungle of the busy streets of Marawi City. The ISIL-inspired militants have held favorable battle positions on the initial phases of the battle by being stationed on high-grounds and protected by thick walls of the structures in the city. Philippine soldiers were forced to enter the buildings one-by-one, hammering concrete wall-by-wall, in the hope of overpowering the enemy forces without being targeted by snipers on open streets. Plummeted by fighter jets and bombarded by missiles from the air, hundreds of drones flew on reconnaissance missions to combat zones before infiltration by the Army and the Marines while the Navy scouted and secured exit points all over the island of Mindanao. The battle, the most complicated so far, yet the fastest resolution took place in just five months. Concluded after the fall of Isnilon Hapilon and Omar Maute. But led to the sacrifices of over a hundred lives of government forces, over a thousand wounded, and a million displaced. Now that the battle is over, the next step would be to rehabilitate the city after the battle has left the city in ruins. 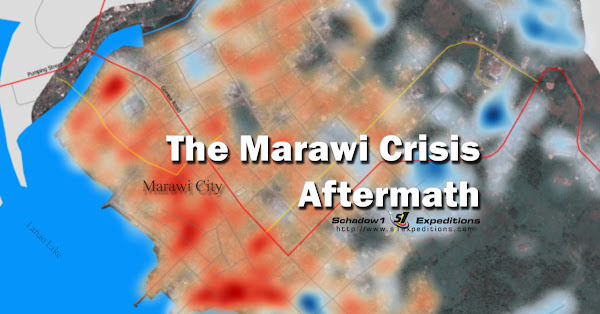 Schadow1 Expeditions has mapped the main battle area of Marawi City in preparation for its rehabilitation efforts and identified the status of structures that were affected by the war. The Marawi crisis has resulted in the damage of over 95% of the structures in the main battle area of about 4 square kilometers. Of those affected, 3,125 structures were completely destroyed or uninhabitable, 913 buildings are heavily damaged, while 1,232 structures were partially damaged. There are 30 barangays that are within the main battle area to which most of the affected barangays are Banggolo Poblacion, Bubong Lilod Madaya, Daguduban, Dansalan, Datu Naga, Datu Sa Dansalan, Kapantara, Lilod Madaya, Lumbac Madaya, Marinaut East and West, Moncado Colony and Kadingilan, Norhaya Village, Raya Madaya I and II, Sabala Manao (including barangay proper), Sangcay Dansalan, South Madaya, Tuca and Wawalayan Marinaut. 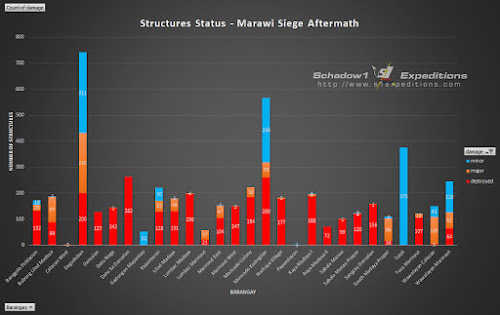 Datu Sa Dansalan, Sangcay Dansalan, Dansalan, Datu Naga, Norhaya Village, Raya Madaya, Sabala Manao suffered the most in the war as almost 100% of the structures in those barangays are completely wiped out. Request data, license information and re-use. Shapefile of the status of structures can be requested to Schadow1 Expeditions to which the data is available under ODbL provided it is shared on the same license, Schadow1 Expeditions is attributed to the data and its logo prominently displayed on all redistribution and adaptations based on the data. 2017-12-06: United Nations Office for the Coordination of Humanitarian Affairs. 2017-12-14: Rodrigo Duterte, President, Republic of the Philippines. Received 2017-12-15.